And dreamt of home while fast asleep." So wrote 23-year-old Willard Bontrager in “An Ode to 32 Cowboys,” a poem he presented to his crew at their Christmas program on the SS Morgantown Victory on Dec. 25, 1946. Willard Bontrager's crew on the SS Morgantown Victory delivered 750 horses to Yugoslavia in December 1946. Photo courtesy Harold Cullar. How did these men come to be at sea on Christmas? Heifer International’s predecessor, the Heifer Project, was a program of the Brethren Service Committee of the Church of the Brethren. At the end of World War II, the Brethren Service Committee entered into an agreement with the United Nations Relief and Rehabilitation Administration to recruit all of the cattle attendants needed for 360 livestock shipments to help devastated countries rebuild. In return, the United Nations Relief and Rehabilitation Administration agreed to ship Heifer Project animals free of charge. About 7,000 men of all ages, religions, colors and walks of life responded to the call for “seagoing cowboys” in 1945 and 1946. A number of these cowboys found themselves away from home over the holidays, many for the first time. As Bontrager’s ode suggests, this affected some more than others. Cowboy Al Guyer of the SS Mexican had already been to Poland in 1945. There he had seen and smelled the rubble of war and experienced the hospitality of grateful Heifer Project recipients in the village of Suchy Dab. That Christmas Eve found him on his way home off the coast of Norway, where the SS Mexican was sitting out a storm. Cowboys sing carols on the Attleboro Victory after delivering mules to crete in 1946. Photo courtesy Harold Cullar. But the storm didn’t stop the festivities Christmas Day. Guyer’s shipmate Calvert Petre noted in his journal, “[J]ust when they had the tables set for the feast they sent word down to watch the tables. No one took them serious enough and when the storm hit us broadside, what a roll! It slid oranges, apples, candy, plates, and boys all on a pile.” They reset the tables and soon were digging into a duck dinner with all the trimmings. Some cowboys were not able to enjoy their special Christmas meals, though. SS Santiago Iglesias cowboy Milt Lohr said in his diary, “Nearly everyone off feed (seasick).” His ship got caught in the same storm as the SS Mexican. Festivities in the cowboys’ quarters didn’t stop with food. On the return trip of the SS Rockland Victory in 1945, cowboy Carly Geisler noted, “We had brought a tree along from Poland and celebrated a very blessed Christmas in mid- Atlantic,” complete with a Christmas Eve program and a Christmas Day party with a gift exchange they had planned before leaving Poland. Most of the cowboy crews had special Christmas services or programs of some sort. On the SS Carroll Victory, in early December 1946, Charlie Lord organized a glee club. “We figured nine carols tonight that we can do,” he wrote his wife. “We have no pitch pipe, let alone piano. I used a harmonica for a pitch pipe tonight. The rehearsal was quite successful, I thought.” And the Christmas Eve program too was complete with sheep bell accompaniment on “Jingle Bells.” Having just crossed the equator on their way back to Greece from South Africa, sweat rolled off the choir in their uniforms of white T-shirts and white shorts as they sang their finale, “White Christmas.” Cowboy Paul Beard, one of several photographers in this crew, showed slides on the wall of snowy roads, woods and glistening treetops as the choir sang to their enthusiastic audience of cowboys and a half-dozen of the ship’s crew. Caroling outside the captain’s stateroom followed, making a memorable Christmas for all. SS Morgantown Victory cowboys (from left) Hugh Ehrman, Sanford Summers, Ellis Friedline and Ray Keim spend Christmas Day in Nowy Port, Poland. For the crews who weren’t at sea on Christmas, the holiday could be a day of contrasts. The SS Morgantown Victory pulled into Nowy Port, Poland, Christmas Eve afternoon 1945 to find a town in ruins. Christmas morning, four cowboys attended a Catholic Christmas Mass, entering a crowded church, its doors and walls decorated with bullet holes. They later happened upon the home of a photographer and had their picture taken. The family invited them in to see their tree, served them orange cake, sold them some of their china, and told them, “It is just like God coming into our home.” Ray Keim, one of these four cowboys, recalled that two others in their crew gave up their Christmas dinner of turkey and veal and all the trimmings so two Polish children could come on board and eat. “They were so overwhelmed by the sight and smells of the food that they hardly ate anything,” Keim said. In the afternoon, the foursome went into Gdansk (formerly Danzig). “Lots of people covered up because of being in cellar whenhome blown up,” Hugh Ehrman jotted in his diary that night, a sobering thought after returning to the ship for supper and singing songs in one of their rooms to end their holiday. The following December, the SS William Halsted delivered its livestock shipment to that same port. 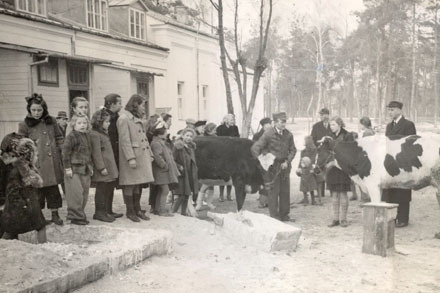 The heifers were distributed to orphanages and individuals near Warsaw and in the former East Prussian district of Mazury. The Brethren Service Committee had sent along food, clothing, medicine and books to be distributed, as well. The committee had made arrangements for cowboy supervisor L.W. Shultz and three of his crew to stay in Poland for several weeks to do some followup work. The Halsted’s captain insisted they return with the ship Dec. 11, but a determined Shultz and his men went AWOL, staying the night before the ship was to leave with an old cobbler they had met. They returned to the pier the next morning to wave to the departing cowboys, who knew they were staying behind. Shultz and his men spent a memorable Christmas at the orphanage of Villa Skaut in Konstancin outside of Warsaw. A heifer named “Hope,” donated by the Coventry Church of the Brethren in Pennsylvania, her calf, and another heifer went to this orphanage. Two heifers arrive at the Villa Skraut orphanage in Konstancin, Poland. Photo courtesy Ray Zook.